Summer Read: Worst. Person. Ever. by Douglas Coupland - ishotjr.com - Put a little mustard on it! Reading is an extremely important part of my life, though I seldom find the chance for “pleasure reading” as opposed to the more software development-oriented tomes you’ll typically find here. I do, whenever I am able to, attempt a “summer read”, and since he is one of my absolute favorite authors (and easy Top 2 Douglas! 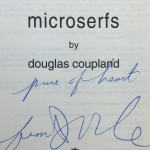 ), and his publishing cadence seemed, at the time, to match my appetite, I can recall Douglas Coupland novels accompanying many treasured summer memories – starting with Microserfs just before heading to Redmond myself, and ending, if I recall, with my devouring The Gum Thief on a beautiful Cayman beach (and the resultant extreme sunburn from being unable to put it down). After a lapse during which I found almost no time for fiction, I resumed with Generation A last year, which instantly swept me back into that wonderful milieu of cultural touchstones and memes that Coupland creates so beautifully. I was frustrated to find no other publications since The Gum Thief, and while pop-up project Temp kept me busy for a while, it was the announcement of Worst. Person. Ever. that caused me to reload and train my reading rifle after its recent decommisioning. For some reason, the US publication was delayed, though just as I was about to give up and order from amazon.ca, it finally became available, and I ordered it from our delightful local bookshop here. I won’t bother recounting the plot – that’s already been done – but rather share my impressions of the book. The book is introduced as, like many of Coupland’s others, an experiment of sorts – in this case, an attempt to revive the biji genre, which sounds interesting as described: “contain(ing) anecdotes, quotations, random musings, philological speculations, literary criticism and indeed everything that the author deems worth recording.” In fact it was so interesting, that I headed to Wikipedia to find out more – only to discover an almost verbatim description. I was shocked – I’d not even started the book, and was already repulsed by what seemed like flagrant plagiarism by one of my most beloved authors. As I began the book, however, my initial impression evolved. Littered throughout were similar verbatim extractions from Wikipedia, sometimes with a wry closing from the author – which I started to acclimate to – in fact appreciate – the truth was, without explanation, many of these terms would have resulted in my pausing to search Wikipedia for additional insight; yet again, Coupland seemed to be right there with current society, already reflecting our latest habits in the pages themselves. There were few other note “types” to be found – occasional travel durations which didn’t really seem to be incorporated into the narative, and a particularly delightful brainstorming of possible SPAM ingredients, which if it wasn’t contrived, is brilliant, and if it was…is still brilliant. Without any prior experience of the genre, I was mildly disappointed with the meta content – Douglas Coupland is a visual artist as well as an author – what would have delighted me beyond comprehension would have been something approaching Nick Bantock’s Griffin and Sabine – a favorite from younger days – and a format that might have allowed Coupland to combine his many talents in a single tome. Perhaps the novel’s underlying nihilism is getting to me as I write this – quibbles aside, I greatly enjoyed Coupland’s latest as I have every other of his plublications. Even the “About the Author” made me laugh – mimicking the format of the interspersed Wikipedia entries, it seemed to start off dry and formal, then start to reveal traces of the author’s influence – “…He now looks back on those few photos that exist and wishes he’d taken more, as he was, for a short window of time in the mid–1990s, technically hot” being of particular amusement, given the picture of he and I that I have from that period – I’m not going to post it here, but it’s available by request if you’d like to make your own evaluation! I very much enjoyed your impressions of the book . I agree that no Brit would ever say ‘package of crisps’ what was he thinking? Thank you for a well written piece that whetted my appetite for Douglas Coupland books! I too remember Griffin and Sabine with fondness.